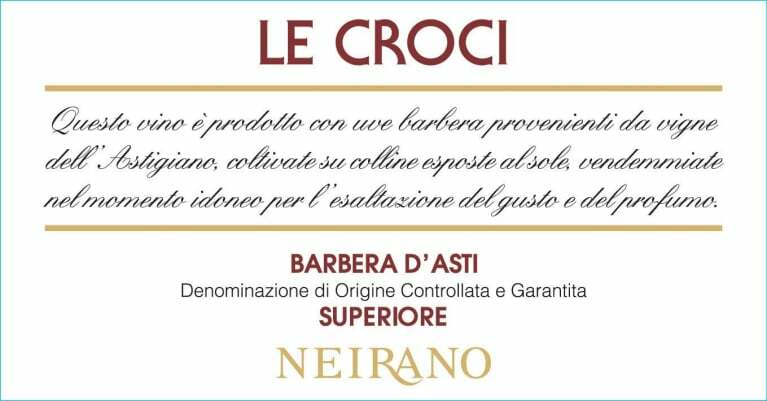 Le Croci: Le Croci (“The Crosses”) is produced by the Sperone family who have been making affordable premium wines for four generations. In 1911, Antonio Sperone opened a small wine shop in Torino where he sold bulk wine directly to consumers. Unsatisfied with the quality and price of the local wine, Antonio started his own winery in Puglia and built a bottling facility in Torino. He was soon able to offer his customers quality wines at prices everyone could afford. Sadly, it was destroyed when the city was bombed in WWII. The winery in Puglia survived the war and enabled Antonio’s grandson Giacomo to open a new facility in 1965 near Milan where he produced vermouth, sparkling wines, spirits and fine wines. In 1983, the family purchased 75 acres of prime vineyards in Piedmont and built the current winery in the small town of Mombaruzzo just outside Monferrato. The Wine: Select grapes are hand harvested from the Le Croci (“The Crosses”) vineyard. This special site sits right outside the winery on a modest hill side facing south-east. The soil here is calcareous, and produces concentrated, deeply colored Barbera grapes, fit for producing rich wines with the capacity to age gracefully. Three weeks of maceration is followed by fermentation in stainless steel for four weeks at 77°F. The wine is aged for one year in small oak casks and six months in bottle before release. Tasting Notes: Dark crimson color in the glass, and the nose has a modern, full-bodied, ripe cherry and toast aroma. Lush and smooth on the palate, with wild blackberry flavors framed by ripe tannins, bright acidity and hints of vanilla. Food Pairings: Served with cured, grilled or roasted meats, hearty pasta dishes, or rich cheeses. Jim Lutfy’s Thoughts: A pop of fresh blackberry and blueberry fruit with a long and silky finish. Best served with pasta and a classic tomato sauce! Wine Club Member HOT Deal: 2013 Tenuta Frescobaldi di Castiglioni. This lovely Super Tuscan comes from one of Italy’s oldest premier Tuscan wineries, with roots dating back to the 16th Century. This blend of Cabernet Sauvignon, Merlot, Cabernet Franc, and Sangiovese is in limited supply with a great price! FWS Wine Club Member Price $19.99, A $10 savings with your Wine Club Member Discount!!! Tortoise Creek Wines: Tortoise Creek is an outstanding line of varietal wines that have been sourced from vineyards predominately in the Lodi region. Great importance is placed on sustainable practices in both the vineyard and winery and the large majority of the Tortoise Creek wines are certified sustainable. The wines all represent the purist possible examples of single varietal wines and all are remarkable value. 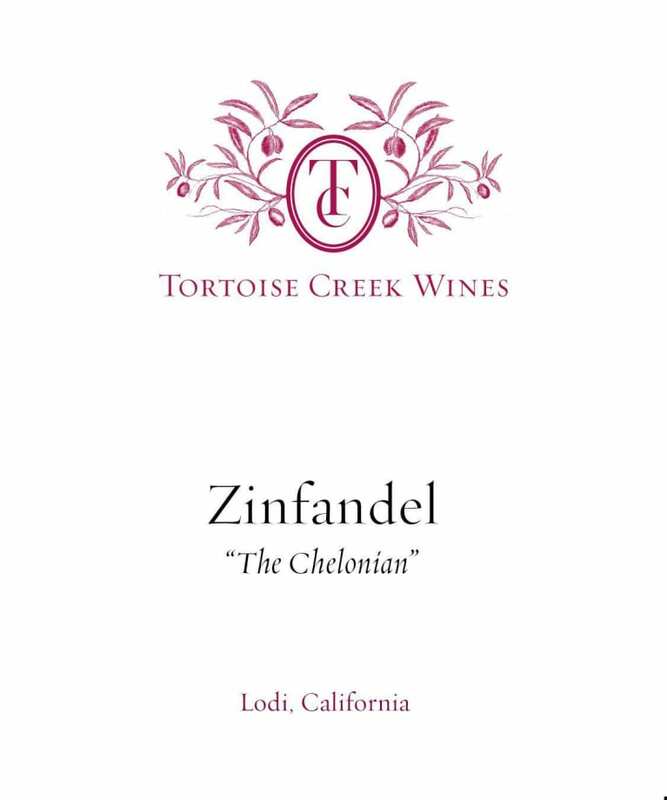 Starting with the 2009 vintage Lodi Zinfandel “The Chelonian”, Tortoise Creek Wines has partnered with the Chelonian Research Foundation (CRF) to donate a portion of the annual profits to benefit the conservation of turtles and tortoises. The Chelonian Research Foundation, a non-profit organization, was founded in 1992 by Dr. Anders G.J. Rhodin for the production, publication, and support of worldwide turtle and tortoise research, with an emphasis on the scientific basis of chelonian diversity and conservation biology. More information can be found at Chelonian. The Chelonian Zinfandel: “The Chelonian” refers to the genus of tortoises and turtles. The Zinfandel fruit comes from three well-managed vineyards in the Clements Hills and Lodi-proper areas near Sacramento and is a blend of 90% Zinfandel, 5% Tannat and 5% Petite Syrah. Gravity flow handling is used where the fruit is destemmed (but not crushed) and whole cluster fermentation maximizes flavor and color extractions. Extended maceration was used to add depth, structure, complexity and to stabilize the unique color of Zinfandel. To fill in the mid-palate and add softness the wine was aged in oak for 6 months. Tasting Notes: No other variety represents the region of Lodi like Zinfandel. Over 100 years ago European settlers believed it to be the best fit for the climate and soils and their keen insight paid off. Our Zinfandel “The Chelonian” has a lovely spicy, cherry like bouquet and is bursting with sweet, berry flavors. There are also delicious overtones of black currant and plums, with a welcoming finish of vanilla and cinnamon toast. Food Pairings: Zinfandel wine is happiest when paired with anything from the meat aisle, burgers, grilled sausages, lamb chops, pork, meat stews, hearty pastas, or barbequed dishes. If cheese is more your thing, try The Chelonian Zinfandel with aged cheddar, aged Gouda, parmesan, asiago, or a dry cheddar jack. Jim Lutfy’s Thoughts: Big, rich, and spicy with layers of complexity; best served with zesty grilled or BBQ meats! Wine Club Member HOT Deal: 2015 The Omen Zinfandel is a classic example of terroir-based Sierra Foothills Zin. We currently have what may be the last of the retail inventory in existence. With the 2016 vintage, The Omen winemakers decided to discontinue the single-varietal bottling; instead, using the fruit for blending. FWS Wine Club Member Price $24.99!!! Grab a bottle or two before it disappears…FOREVER. Les Jamelles: Catherine and Laurent Delaunay are the heart and soul of Les Jamelles. In the early 1990’s, these two winemakers, both from Burgundian families rooted in the world of wine for several generations, were won over by the diversity of the Languedoc’s terroirs and the grape varieties. Catherine likes to say “the terroirs are there for the grapes.” In the mid-1990’s, the Languedoc region was not known for producing high quality wines; however, it’s reorganization had gotten underway and the pair sensed that it was a land full of promise, with the freedom and ability to grow fifty or so different varietals. In regards to the personal hallmark Catherine and Laurent have made in the region, Catherine has this to say: “In a region where the wines were considered to be very powerful, we wanted to add a touch of Burgundy to our cuvees-to make them fresh, elegant, and complex. Over the years we have discovered many shared features between Burgundy and the Languedoc. It is said that Burgundy is a ‘mosaic of terroirs.’ I would say that the same is true in Languedoc, but to the power of 10!” To ensure its success, Les Jamelles has remained faithful to its original philosophy of listening to consumers (in over 45 countries) and offering them delectable, expressive and accessible varietal wines whose roundness, rich aromas and flavors evoke a certain art of living in the South of France. Les Jamelles Grenache: Grenache is a grape variety which performs best when it grows in arid regions. 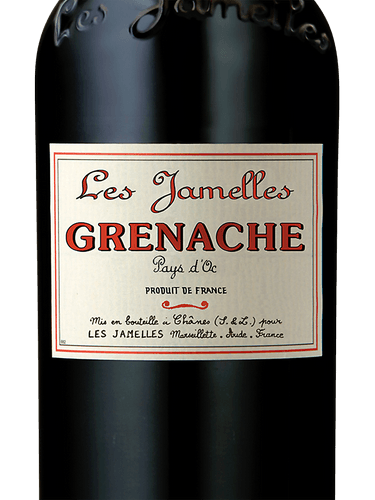 The red Grenache “Les Jamelles” is smooth and fruit-forward. It is an easy-drinking wine, perfect for informal gatherings and picnics. This Grenache was cultivated in the Pays d’Oc region in the South of France, between Béziers and Perpignan near the Mediterranean coast. The 10-20 year-old sloping vineyards are located on clay-silty soils coming from the old Aude River, and from the clay-limestone soils of the Minervois. The Pruning method is “Cordon de Royat” ( a spur trained trellis system that is widely used in the Champagne region of France to grow Pinot Noir). and the yield is approximately 50 hectoliters per hectare. The grapes are totally destemmed and undergo a long temperature-controlled maceration with regular pumping over. Malolactic fermentation is completed. 5 to 10% is aged in oak barrel for 7 to 9 months. Tasting Notes: Deep purple in color with vivid highlights, it is a rich, rounded, and fruit forward wine (raspberry) with spicy undertones (pepper, cinnamon, tapenade). Food Pairings: It can be easily served with Terrines (Pate) or with Mediterranean cuisine, as well as grilled meats (lamb and meat stew) or sauced meats. Serve at 62-65 degrees. Jim Lutfy’s Thoughts: Loaded with spicy flavors of Paprika and fresh Red Pepper; the wine has an explosion of flavor on the palate. This Grenache is best served with Chicken, Pan Seared, or Smoked Salmon. Primary Wines: Primary Wines was born out of the desire to bring good wines at great prices to people who aspire to live free and drink well. At the same time, it was imperative to stay true to our ideals, one of which is the essential understanding that all good wines are created equal, but if and only if they reflect their primary and wholesome source, which is the grapes that they are produced from. Finally, we wanted to embrace and encourage the natural intelligence and inquisitiveness of our fellow drinkers by giving them a little insight into the often opaque language used by wine connoisseurs, hence the brief lesson appearing on our labels. In our communal quest to live well, we invite you to go back to the basics and enjoy our fruit-driven, thirst-quenching Primary Wines. California Cabernet Sauvignon: Cabernet Sauvignon has been referred to as the king of red wine grapes. Cabernet Sauvignons and blends where the variety predominates are some of the most prized wines produced in California. The grape is also the main ingredient in blends for many of the famous red wines in the world. Cabernet Sauvignons are dry, full flavored and made to be long lived for many labels. The aging potential can be upwards of 10-20 years, though five to nine years is more usual and many can be enjoyed upon release. Fans of Cabernet Sauvignon are familiar with the wine’s common descriptors: berry, currant and cassis or herbaceous, bell pepper and toasty oak aromas and flavors. For traditional California table wine volume sold in U.S. food stores, Cabernet Sauvignon is the second leading varietal after Chardonnay, according to the Nielsen Company & Gomberg, Fredrikson & Associates. DNA genetic fingerprinting research at the University of California at Davis has revealed Cabernet Sauvignon to be a cross between the Cabernet Franc and Sauvignon Blanc grapes. The variety is California’s most widely planted red wine grape with 90,782 acres reported in 2016. Napa Valley, San Luis Obispo County, Sonoma and Lodi/San Joaquin County are the regions with the most plantings. Tasting Notes: Full-bodied with aromas of cassis, dark plum, crushed berry and slight notes of dried herb and vanilla. Lingering fruit flavors carry through with mid weight tannins on the finish. Food Pairings: The moderate to high tannin levels and concentrated flavors in Californian Cab make it a sensational food wine. It’s superb with porterhouse steak, braised pork belly, hearty lamb stews, Portobello mushrooms and grilled burgers. Jim Lutfy’s Thoughts: Big & rich with layers of complexity and a long, lingering finish. Best served with Steak or Pork dishes. Wine Club Member’s Great Buy: Utilize your Wine Club Member discount to enjoy the 2016 Sequoia Grove Cabernet Sauvignon. The wholesale cost increased with the release of the 2016 vintage, but we did not raise the price…for now. Don’t miss out on this great value from Rutherford in the Napa Valley! …Wine Club Member Price $39.99/Bottle. Laroque is made from historical vineyards in the ancient region of Carcassonne that produce an extraordinary and unique wine made from 100% Cabernet Franc. Laroque (from the Latin roqua) translated ‘The Rock,’ derives its name from the Menhir (single lone-standing stones that date back to the middle of the Bronze Age) which are found around Carcassonne. During the Middle Ages, the vineyards belonged to the Bishop of Carcassonne, who was renowned for making the best wines in the region. Local legend has it that the devil, upset with the Bishop of Carcassonne for stealing his ‘clients,’ tried to stone the Bishop with giant rocks. Following the attack, the Bishop constructed the fortress of Cazilhac with these Menhirs and marked the event by placing a cross on the last remaining Menhir. After this, processions were undertaken around this oratory and all the parcels of vines that surrounded it, including those of Laroque, in order to ward off the devil. The vineyards which produce Laroque have been making wine since the 6th century. Laroque Cabernet Franc is an easy-drinking wine that combines the structure, minerality, and dusty rose characteristics of Cabernet Franc with the lively, fruitiness of wines from the south of France. The Laroque vineyards are located near the city of Carcassonne, famous all over the world for its medieval city and the Canal du Midi, both classed as World Heritage sites by UNESCO. Situated between the Pyrenees to the south and the Black Mountains to the north, Carcassonne enjoys a privileged climatic position where the excesses of the Mediterranean climate are tempered by the softness of the Atlantic. This results in sunny, hot, dry days, but very cool nights. This extraordinary harmony in nature creates wines that are fresh, fruity, elegant, rich and balanced. The average age of the vines for Larouqe is around 25+ years. They are grown in clay and limestone soils on hillside vineyards that experience alternating warm winds from the Mediterranean, humid winds from north-west Narbonne, and dry temperate winds from the Atlantic. The grapes are destemmed and pressed gently. Fermentation is completed with fresh oak to enhance aromas and structure. A ‘remontage’ (pump-over) is performed 3 times a day until ‘delestage’ (racking of the wine during fermentation to soften tannins). Then 2 pump-overs daily are done toward the end of the maceration period and there is no fining, but filtering is done prior to bottling. Domaine Laroque is a medium-bodied, fresh and fruity wine, with luscious flavors of red berry and vanilla. Enjoy it alone or paired with Mediterranean cuisine, Asian cuisine, pasta, lamb, chicken, pizza and hamburgers. Spicy, rich, and layers of complexity with a long and lingering finish. Best with spicy meat dishes! Marty Peterson comes from a family with a rich farming history. In 1904, his great-grandfather, Carl A. Peterson, made his way by ferry to Lodi, an agricultural community at the mouth of the Sacramento River Delta, 60 miles east of San Francisco, where he founded the family ranch. For more than a century, the Peterson family has farmed 100 acres in the Lodi region, now planted to fine wine grape varietals, as well as Bing cherries. The fourth generation of growers from the family property, Marty grew up in a community of farmers who shared a similar commitment to the land. The childhood friends and family relationships forged over many years are still firmly in place, giving him an insider’s insight—and connections— into this important, emerging winegrowing region. Marty received his Bachelor of Sciences in Enology from Fresno State University in 2002, giving him expertise on the cellar side and refining his natural farming knowledge. Peterson joined Vintage Wine Estates in 2011 as winemaker for Viansa Sonoma; in May of 2015 he was then appointed Winemaker at Cosentino Winery, where he draws on his deep roots in the Lodi region, as well as his knowledge of the Napa and Sonoma appellations, to create uniquely expressive wines of balance and complexity. Cosentino Winery is renowned for creating the first designated and licensed Meritage wine, Bordeaux inspired blend (The Poet) that set the standard that others would follow in Napa Valley. In 1990, ‘THE’ Series was introduced with ‘THE Zin,’ showcasing the best grapes from the Lodi AVA and paving the way for ‘THE’ Series of wines. ‘THE’ Series is now our largest volume collection of wine from the Lodi AVA. 2016’s THE Dark is a proprietary blend of Petite Sirah, Petit Verdot and Cabernet Sauvignon aged 12 months is French oak barrels. The grapes for THE Dark were hand-harvested in Lodi, an AVA known to benefit from the cooling Delta influence. The 2016 harvest was notably even and steady, providing balanced yields of quality fruit which allowed us to craft a wine with both freshness and depth of fruit. Don’t be afraid of THE Dark – enjoy now or over the next three years. Undisclosed percentages: Predominantly Petite Sirah blended with Petit Verdot, and Cabernet Sauvignon. THE Dark lives up to its name with an inky dark hue in the glass and rich aromas of plum, blackberry jam and blueberry cobbler. The palate is dense with fruit flavors, pepper spice and vanilla barrel toast leading to a brooding finish that is smooth and opulent. THE Dark can hold its own against slow-roasted short ribs and rosemary-crusted lamb or a slow cooked herb-crusted bottom roast with carrots, onion, celery, potatoes, and stewed tomatoes; however, it is equally delicious to indulge in after dinner alongside aged Gouda or flourless chocolate cake. THE Dark would also be a perfect pairing to Valentine’s chocolates and a romantic candle-lit evening with your sweetheart!! Big, rich, and chewy…A full throttle Wine that way overachieves; best served with BBQ!!! Basking in the balmy Adriatic-cooled microclimate of the Salento peninsula in Puglia, on Italy’s heel, Agricole Vallone is a large multi-tasking agricultural concern with 170 hectares of vines interspersed with other crops; mostly olive trees, artichokes, and vegetables. It was founded in 1934, but like others at the time, sold grapes to the local co-operative. It was only in the late 1990s that it began bottling its own wines, but it quickly made its name with its flagship wine Graticciaia, a partially barrel-aged red made largely from negromaro grapes dried on mats (graticci) in the autumn sunshine. Designated IGT Salento, this is a very special wine with powerful, concentrated flavors that ages beautifully. The Vallone family started the winery in the 1930s, and many years before then they were Puglian bankers. Now, Francesco Vallone is running the business. He is a tall, usually immaculately dressed, always polite, and very driven Italian, who spends a vast amount of his time doing business in Milan. Francesco only took over the business recently following the tragic and premature death of his father (it had previously been run for many years by his two aunts, Vittoria and Maria Teresa Vallone). The family still owns a grand building in the heart of the beautiful southern Italian city of Lecce, where the company’s office is located, as well as where the family lives. The ‘building’ is actually a 400 year old castle that was used as a fortress to protect the locals from the Crusaders as well as to produce olive oil and wines. Francisco plans to restore and transform the castle into a resort with private rooms, where guests can enjoy facilities such as private swimming pools, private dining rooms, private cooking facilities, and an exclusive spa. The IGT, DOC and DOCG acronyms are designations used for the Italian wine appellation system (similar to the French AOP system, from which most countries have modeled their industries). Each individual designation has specific rules controlling the various factors of winegrowing: what grapes are allowed, grapes to yield per hectare (@2.5 acres), geographic borders, alcohol levels, ageing, etc. These strict regulations ensure that certified growers have a safeguard on the quality and the authenticity of their products. Indicazione di Geografica Tipica, or Indication of Typical Geography (IGT), is the 1st level of designation for Italian wines. With this designation, winegrowers do not have to follow the specific growing and winemaking rules as they do with the DOC & G, and thus have more creative freedom. You can find beautiful IGT wines all across Italy; however, the only rule is that the wines must originate in the stated region. An elegant nose leads to flavors of ripe plum, baked raspberries, and spice-cabinet notes like anise, allspice and cinnamon. Even though Negroamaro is full bodied it is not too tannic or acidic, and instead leads with bombastic fruit which makes it easy to chug, especially alongside meatballs or pizza. This fruit-forward gem can pair with many foods because the wine’s personality is not overly dominant. You could pair spicy foods, fatty meats like Lamb, red sauce dishes, and hard and soft cheeses. Foxglove is the value label from twin brothers Jim and Bob Varner. “The idea,” says Bob Varner, “is to be as simple as possible.” At the core of Foxglove is Bob Varner, also the winemaker at Varner Wines. Starting from their first vintage in 1991, Bob sources his Pinot & Chardonnay from a variety of places, all of which are in Edna Valley. The resulting wine has Central Coast appellation pricing, and is full of the complex fruit flavors that the Edna Valley appellation is known for. Edna Valley, a relatively small appellation, grows mostly Chardonnay on about 1000 acres. The entire acreage is tightly controlled by a few owners employing the most up-to-date vineyard practices that give the valley impressive evenness. Located just south of San Luis Obispo, its vineyards are some of California’s closest to the Pacific Ocean. Mild winters, cool, foggy summer, and clay-loam soils produce a combination of flavors that have been described as “textbook Central Coast.” Bob and Jim Varner are best known for the Chardonnay and Pinot Noir they produce under the Varner label, but Foxglove has become one of the great value labels made in California. The Foxglove wines are selected from several sites located in the Central Coast and are made with the same care and dedication as the Varner wines. The warm climate and ocean influence create wines that burst with fruit but have plenty of vibrancy and freshness. The use of oak is minimal and the Chardonnay is non-malolactic. While Chardonnay is the best know varietal from Foxglove, the Cabernet and Zinfandel have slowly gained an equally strong following. 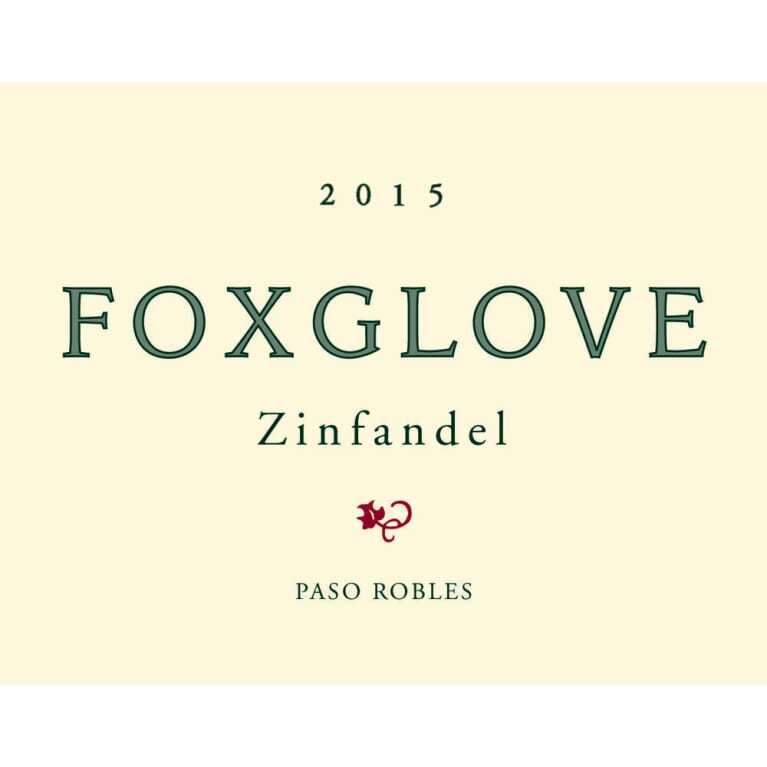 Food & Wine picked the 2015 Foxglove Zinfandel as an exceptional bargain bottle for under $20: “The juicy wild berry and herb flavors in this great-value Zinfandel finish with tart acidity” August 7, 2017. Sourced from the Northern area of Paso Robles, the vines have an average age of twenty-five years. The vines are planted on rolling hills with loam soils at 900-1,000 feet of elevation. 100% destemmed, pressed at dryness, and malolactic completed after pressing. The use of stainless on the Foxglove Zin keeps the ripe fruit from being too dark. Offering up pretty aromas of strawberries, blackberries and spice, the 2015 Zinfandel is medium-bodied, supple and velvety, with melting tannins and a juicy core of fruit. This is a delicious Zinfandel that represents amazing value. Zinfandel wine is happiest when paired with anything from the meat aisle, from barbeque pork ribs, leg of lamb or a big, hearty meal. Think Pork, Beef, Lamb, Italian Sausage, Spare Ribs, Brisket, or Venison. You can also enjoy Zinfandel with bold, hearty soups, as well as your favorite kind of pizza. If cheese is your thing, try Foxglove Zin with Parmesan, Aged Cheddar, Aged/Smoked Gouda, Asiago, or Dry Jack. All-in-all, Zinfandel is a versatile wine for pairings! Textbook Zinfandel: Purity of flavor, loads of spice and tart cherry!! Big back bone and a long lingering finish; best served with BBQ or Grilled Meats! Just a few kilometers outside Florence, on the rolling hills of Impruneta near Pozzolatico, lies Azienda Agrícola Lanciola. It is immersed in the distinctive Tuscan countryside, amidst olive-groves, cypress trees and vineyards. The estate totals around 80 hectares, with 40 hectares covered by vineyards and the remainder devoted to olive groves. The property has a very illustrious past. In Medicean times it belonged to the noble Ricci family, who was also responsible for organizing the estate’s early farming and winemaking activities. The goal of the present owners, the Guarnieri family, has been to maximize the use of the land. The estate’s vineyards – formerly called “Terre dei Ricci” – produce ”Terricci”, an IGT (Indicazione Geografica Tipica) red table wine which is obtained mainly from large berry Sangiovese Grosso and Cabernet Sauvignon grapes; “Ricciobianco,” a white wine with excellent structure obtained from Chardonnay grapes; a Chianti Colli Fiorentini, a Vinsanto fortified wine; and finally, “Riccionero,” a pure Pinot and top quality Extra Virgin Olive Oil. In Greve, in the heart of the Chianti Classico area, the Azienda Agrícola Lanciola occupies roughly 14 hectares. Ten of those are devoted to specialized vineyards with optimum south-west exposure, on particularly favorable soil, at an altitude of approximately 300 meters. In addition to Sangiovese, the vineyards also contain Cabernet Sauvignon, Merlot, Syrah, Canaiolo and Colorino grapes. In Greve, in the heart of the Chianti Classico area the Azienda Agricola Lanciola has around 14 hectares, 10 of which are devoted to specialized vineyards with optimum south-west exposure, on particularly favorable soil, at an altitude of approximately 300 meters. In addition to Sangiovese, the vineyards contain Cabernet Sauvignon, Merlot,Syrah, Canaiolo and Colorino grapes. The soil is comprised of shale and loam, and the vineyards are situated at 250 meters with a south-west exposure. The fruit was harvested during the first week of October and aged in stainless steel tanks for a minimum of six months. Deep and slightly violet blood red with a lively ruby rim in the glass. The bouquet is fairly intense and fresh with forest berry fruit, cherry, and black currant that gains definition from hints of earthiness balanced with fruit acidity and slight floral accents. On the palate it is ample and smooth with dark berry fruit flavors supported by fresh acidity and slight tannins leading to a clean berry fruit finish. Grilled meats, light stews, venison, pasta Bolognese , or just to drink by the glass at holiday parties with family and/or friends; essentially, this wine pairs great with family, friends, and a good time! Elegant with a plummy mouthfeel and a long lingering finish; great to serve with something tomato saucy! Founders of Chronic Cellars, Jake and Josh Beckett got their hands in the dirt at a very young age; as sons of Paso’s pioneer vintner Doug Beckett. The boys grew up working in vineyards of Peachy Canyon Winery and learned all about winemaking from their father. “We grew up on it — it was grape juice to us,” said Jake. But it was time to break out on their own and the brothers launched Chronic Cellars in 2007 with a small 56-case production of petite sirah. Why petite sirah? “My father gave us some to help us out,” noted Jake, in charge of sales and marketing. Josh handles winemaking duties. From that humble start the production has now grown to 30,000 cases annually. Growing up in a Paso Robles wine family meant chores came in the form of washing barrels, punching down fermenting grapes and working the bottling line. Naturally, the Beckett brothers were destined to make juice. 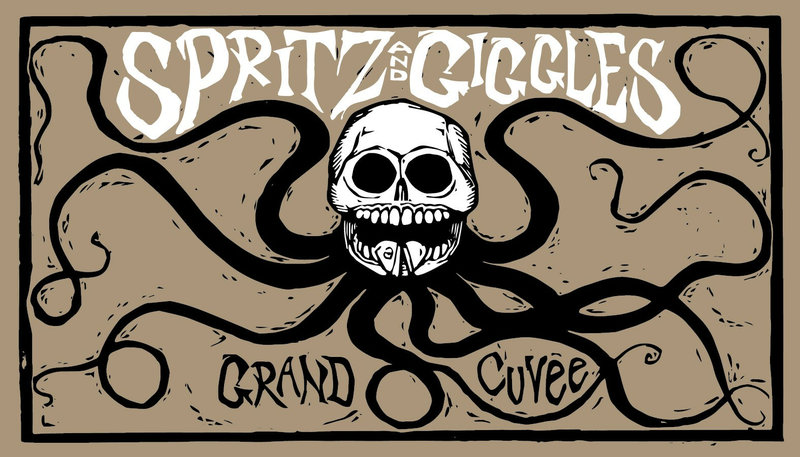 Chronic Cellars is all about using the best, or as the brothers refer to them ‘chronic’, grapes to make seriously good wine for people who don’t take themselves too seriously. Growing up a local has its perks, like knowing all the best grape growers in Paso Robles. They’ve partnered with these neighbors and friends to build an epic network, allowing Josh to select the grapes he wants for all his custom blends. In 2014, Chronic Cellars was purchased by Winery Exchange, a Novato based company, but even with the new ownership, Josh will remain the winemaker, Jake will be in charge of marketing and brand development, and Dawn Beckett is responsible for all the fun in the Chronic Cellars Paso Robles Tasting Room. Made from Pinot Noir and Chardonnay sourced from vineyards along the North Coast of California, this award winning sparkler is vinified using the Charmat Method. This method was developed and patented in 1895 by Italian Federico Martinotti and further developed by Eugene Charmat in 1907. The method is now named after the latter, but is also called cuve close, metodo Italiano or the tank method. The wine is mixed in a stainless steel pressure tank, together with sugar and yeast. When the sugar is converted into alcohol and carbon dioxide, the yeast is filtered and removed, and the wine is bottled. The duration of fermentation affects the quality; longer fermentation preserves the wine’s aromas better and gives finer and more durable bubbles. Bask in the aroma of fresh pears, cut apples, hints of fresh baked bread, light spices, and decorative floral notes. Sip and get a little bubbly with the different citrus flavors along with apples and pears. Pairs well with Gouda or Brie Cheeses, Christmas appetizers, Sweet & Sour Pork, or enjoy it with dessert alongside apple pie, pumpkin pie, or your favorite holiday dessert dish. Light and lively with a good POP! Great with salty Holiday Snacks, salty cheeses, and Charcuterie.